Jim and Bullock are brought in on a “public service homicide.” Detective Flass of narcotics got a tip on the body, Pinky Littlefield from the Uptown Assassins crew. He assumes it is a deal gone bad and leaves homicide to do their job. Jim examines the body and finds a secret compartment in the heel of Pinky’s shoe, containing little packets of drugs. Leon Winkler, the night janitor, witnessed what happens and agrees to go to the precinct and work with a sketch artist. Leon is in an interrogation room, waiting for the sketch artist to come in. Instead, a shadowy man in a hat and coat comes in, checks to make sure he hasn’t spoken to a sketch artist, and stabs him in the back with an ice pick. Everyone is shaken that Leon was killed in “their house,” with the same weapon that killed Pinky – likely the same murderer. Jim is convinced that a cop killed him, but no one wants to join Jim on his witch hunt. He drags Bullock along kicking and screaming, and uses leverage to get one of the cops to give up a name: Detective Delaware. Jim chases the greasy detective in the parking garage, punches him, and handcuffs him. Hidden beneath the spare tire in his trunk are packets of drugs, just like those found on Pinky. Jim makes a big show out of bringing Delaware into a holding cell. Jim brings the drugs to the captain, and Flass claims Delaware was part of an undercover operation. She is turning the case over to internal affairs. Bullock takes Jim aside and privately tells him that Flass and his team are dirty, taking over drug stash houses on raids and running them themselves. Flass is protected by “serious people,” real high up; for all Bullock knows, the commissioner could be getting a piece of the action. Bullock calls in a favor and the two go check the stash houses. They find Delaware and his crew packing boxes of drugs. A melee erupts, but Delaware calms everyone down when he presents a warrant, signed by a judge, allowing them to raid a stash house. Jim knows he is clearing his own stash, but has no ground to stand on. When Leon’s death is ruled a suicide by internal affairs, Jim goes to an unlikely ally for help: Penguin. 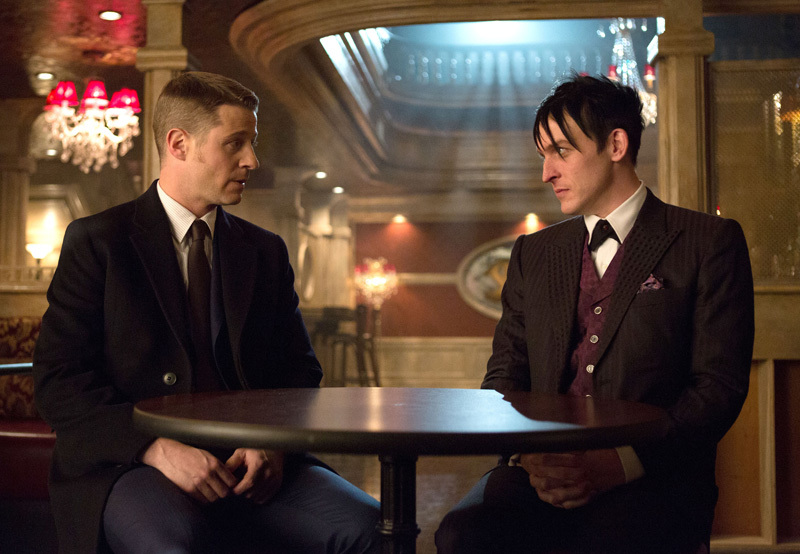 Maroni runs the drug trade in Gotham, and Jim is hoping that Penguin can find someone with the goods on Flass. Penguin promises to make some calls and insists he doesn’t want anything in return. “Friends don’t owe friends.” Penguin also promises that no one will get hurt. Gabe, Penguin’s #2, pays a visit to Delaware and threatens his wife and kids. Next thing you know, Gabe is delivering the murder weapon – still bloody – and a recorded confession, confirming that Flass is the murderer. Jim arrests Flass in the middle of the squad room. He laughs at Jim, telling him that his friends won’t let him. But the captain is on Jim’s side. She puts the cuffs on him and tells another cop to read Flass his rights. Flass’ guys give Jim the stink-eye, but the rest of the squad seems to be on Jim’s side – or, at least, against Flass. But there is a dark side to the easy way of winning a case. As Jim walks down an alley, Delaware approaches, scared out of his mind. He begs Jim to tell him they are even, that his wife and kids are safe. He even drops to his knees. Jim is troubled, realizing the dark path he has walked down. Meanwhile, there is a huge shift in the criminal underworld. Fish is held in a warehouse, about to be tortured by a man with the not-intimidating name of Bob. Butch, after beating and killing the info out of his own captors, jumps Bob, beats him nearly to death, and rescues Fish. He takes her to his home, an oddly normal, domestic home, until Fish is feeling lucid. He wants her to leave town, but she refuses. She’s not going anywhere until she has killed Penguin. Penguin is easy to find: he is busy taking control of Fish’s club. When Butch and Fish show up, he literally grovels at her feet, kissing her shoes. He wants to join forces with her: “Think of how we will fool everyone.” Fish, obviously, does not like this idea, but she can’t do much about it. Zsasz and his henchwomen charge the place, shooting violently. Butch returns fire and hits one of the girls, giving him and Fish time to escape through the service halls. Butch insists Fish go out the window, and he will stay behind to slow them down. Zsasz shoots Butch in the leg, but he won’t say a word about Fish. Zsasz isn’t sure if they should kill him, or “take him along to play with.” We don’t know what happens to Butch, but it seems safe to assume he isn’t dead – otherwise, why not just show it? But Fish is appropriately scared. She meets Bullock on the docks to say goodbye, though she promises she will return when the time is right and kill Penguin. Bullock suggests she doesn’t return at all. He promises that he will find Butch, and if he is still alive, he will help him. Also: The kids are back. After a few weeks in his Swiss home, Bruce is desperate to find Selina, even making Alfred drive him around and around the areas where Selina hangs out. He pays Ivy to pass on a message to her, that Bruce is looking for her. Selina shows up at Wayne Manor, climbing in through the window. He gives her a snowglobe he bought her in Switzerland, then asks her to stay there. She can help him find his parents’ killer, and he can give her a better place to stay. This offends her greatly. She gives back the snowglobe, tells him she lied to get out of juvie, that she didn’t see who killed the Waynes, and bails. Last week’s episode was really good; this one felt like a bit of a cleanup episode; a middling episode before we get underway with a new story arc. On the upside, no Barbara Kean in this episode, which always improves the show. “The Fearsome Dr. Crane” is set to air on February 2. 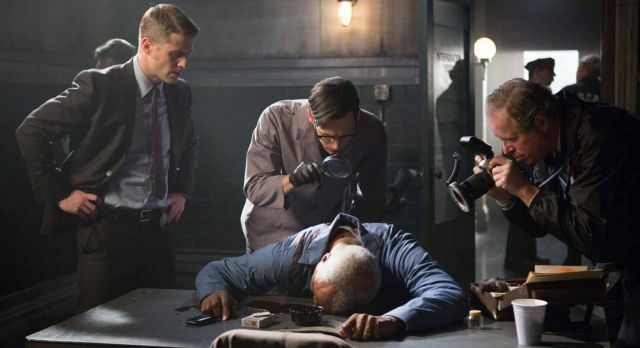 “Gotham” airs Mondays at 8 P.M. EST on FOX.